Recently there is much interest in moving objects databases, and data models and query languages have been proposed offering data types such as moving point and moving region together with suitable operations. 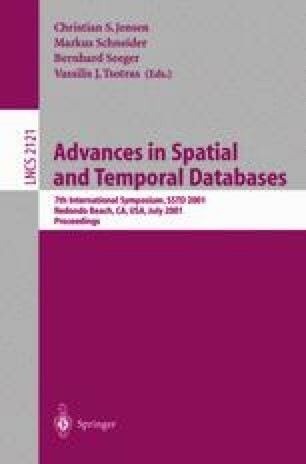 In contrast to most earlier work on spatio-temporal databases, a moving region can change its shape and extent not only in discrete steps, but continuously. Examples of such moving regions are oil spills, forest fires, hurricanes, schools of fish, spreads of diseases, or armies, to name but a few. Whereas the database will contain a “temporally complete” representation of a moving region in the sense that for any instant of time the current extent and shape can be retrieved, the original information about the object moving around in the real world will most likely be a series of observations (“snapshots”). We consider the problem of constructing the complete moving region representation from a series of snapshots. We assume a model where a region is represented as a set of polygons with polygonal holes. A moving region is represented as a set of slices with disjoint time intervals, such that within each slice it is a region whose vertices move linearly with time. Snapshots are also given as sets of polygons with polygonal holes. We develop algorithms to interpolate between two snapshots, going from simple convex polygons to arbitrary polygons. The implementation is available on the Web.